Hedge funds and hedge fund trading strategies have long beenpopular in the financial community because of their flexibility,aggressiveness, and creativity. Trade Like a Hedge Fund capitalizeson this phenomenon and builds on it by bringing fresh and practicalideas to the trading table. This book shares 20 uncorrelatedtrading strategies and techniques that will enable readers to tradeand invest like never before. 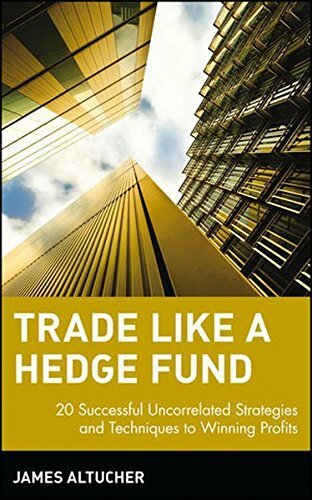 With detailed examples andup-to-the-minute trading advice, Trade Like a Hedge Fund is aunique book that will help readers increase the value of theirportfolios, while decreasing risk. James Altucher (New York, NY) is a partner at Subway Capital, ahedge fund focused on special arbitrage situations, and short-termstatistically based strategies. Previously, he was a partner withtechnology venture capital firm 212 Ventures and was CEO andfounder of Vaultus, a wireless and software company.